Norvic Philatelics: Modern British Postal History: Common stamps - but what were they used for? Once Postal History was regarded as 'anything before 1840'. Later it was realised that postal history could have stamps on, but still many people think '19th century'. The enlightened view is that Postal History is still being made! So how to define "modern"? For the present, I'll concentrate on the present reign - bearing in mind that this could mean including some items that are nearly 60 years old, there is a wealth of material, and I hope to show some very interesting pieces. Common stamps - but what were they used for? 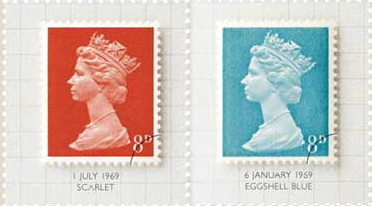 The first set of Machin definitives included an 8d in red (or bright vermillion) issued on 1 July 1968. This was just one of the range from ½d to 1/9d replacing the Wilding definitives started in 1952. But with the 4d brown difficult to process, that value was changed to red, and the 8d to pale blue (light turquoise-blue) on 6 January 1969. But was there a specific purpose to this value, both colours of which are not at all uncommon in either mint or used condition? 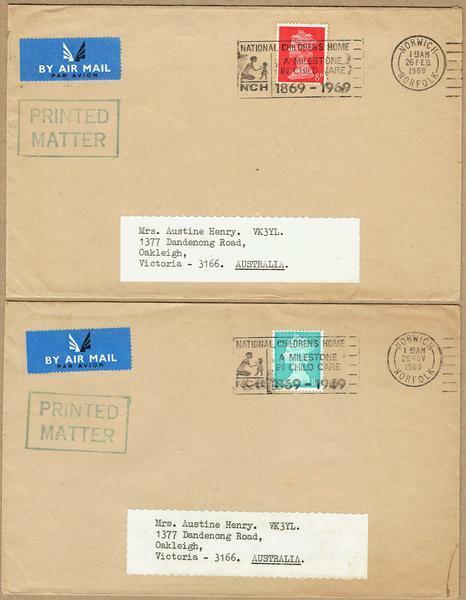 Foreign Airmail 2nd Newspapers Group B ½ to 1 ounce and 2nd class Group C up to ½ ounce. So, how how easy is it to find any examples of these uses on full cover or wrapper today? Well, I would suggest very difficult. Newspaper wrappers are usually discarded, bulk printed paper envelopes or packaging are rarely 'attractive' (or small) enough for people to have collected in the past, and of course collectors in foreign destinations would (at that time) want the stamps for the collections. So although the red had been replaced by the time of the use shown here, it is still scarce enough, and attractive enough to be worthy of including in a postal history usage collection. These two Printed Paper usages from Norwich to Australia, the red on 26 February and the blue on 20 November 1969 sold fifty years later on eBay for AU$65.99 - £35.50 at present. But I'm not actually certain what postage rate they were paying, given the above tables! Another outstanding lady [amateur radio] operator was Austine Henry (nee Marshall), VK3YL, first licenced in 1930. In many ways, Austine had similarities with Florence. She constructed her own transmitters, for which she won prizes and was a keen operator who was deeply respected by other amateurs. In 1934 Austine joined the R.A.A.F. Reserve and during WWII, went on to train many operators in Morse code at the WIA during WWII. Older collectors will have seen some of the envelopes and cards shown here - and like many others they will have either removed the stamps for their collections, torn the corners off the envelopes saving the stamps for disposal as kiloware, or simply discarded them as being 'common'. Yes, much of it was common - once. It was certainly regarded as 'nothing very special', the sort of thing you saw every day at the office - mail from ordinary people, and businesses, with stamps. Ordinary every day stamps. But take a closer look at some of these. Why was the 7d definitive issued, for example? It certainly wasn't primarily to be used in pairs to pay the 1/2d second class recorded delivery rate! At one time the registration fee was 3s, but there was no 3s stamp. The 1/6d stamps were mostly used on mail to Australia (and that's where single-use covers must be! ), but a pair would pay this fee. Browse through these pages, and consider whether you have ever seen some of these stamps properly used, alone or making up an odd rate. And then wonder how many of them actually exist now. Post and Go at Party Political Conference - The post Post and Go at Party Political Conference appeared first on Postage Labels Of The UK.